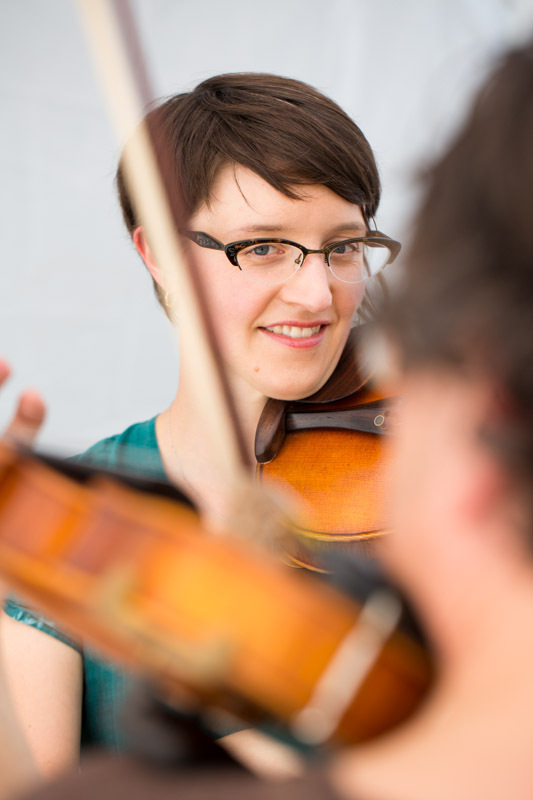 Meghan Coil started Suzuki violin lessons in kindergarten, in a public Montessori school in Cincinnati, Ohio. She attended Denison University in Granville, Ohio, and studied with the amazing Dr. Andy Carlson. Dr. Carlson was himself a bluegrass fiddle player as much as a classical violinist, and created new course offerings for students to study folk music, and in particular for violinists to study fiddling, most of which Meghan happily took. Pretty soon, Meghan was performing regularly and in various ensembles, most notably in the bluegrass band “The Granvillbillies” and the college orchestra, serving as section leader and eventually concertmaster. In 2002, she and Dr. Carlson co-presented “Fiddling for Classical Violinists” at the Suzuki Association of the Americas biennial conference in Minneapolis. Meghan graduated from Denison with a B.A. in English and a Performer’s Certificate in violin. After graduation, Meghan began her Suzuki teacher training and taught violin in the Denison University Suzuki Program. In 2004, Meghan moved to Pennsylvania to teach in State College Suzuki Program. One of the highlights of her tenure at SCSP was the opportunity to accompany a group of advanced students to the 14th World Suzuki Convention in Turin, Italy in 2006. While teaching in State College, Meghan was a member of the Pennsylvania Centre Orchestra and played the fiddle in the three-piece Crabapple String Band. She also played the occasional contra dance and served as a volunteer host/DJ for "The Folk Show” on the local NPR station, WPSU fm. Meghan took a break from teaching in 2007 to pursue interests in food and farming. After a magical six-month internship on an organic beef and hay farm in rural Pennsylvania, and a year of culinary school in Cincinnati, Ohio, however, she found herself working in education again, this time in a public Montessori high school as a one-on-one aid for a student with autism. Over the years, Meghan has enjoyed performing in theatrical productions needing switch-hitting fiddler/violinists for shows such as I Love You, You’re Perfect, Now Change, James Joyce’s “The Dead,” Cotton Patch Gospel, and Big River: The Adventures of Huckleberry Finn. In 2012 she performed in the Oregon Children’s Theatre’s world premiere production of The Storm in the Barn, with original music composed by Portland band Black Prairie. Meghan moved to Portland in 2010 and in 2012 took the leap back into violin teaching by joining the Portland Suzuki Project at Beach Elementary School. In January 2013 she started her private studio, Breathe Suzuki Studio, in North Portland. Currently she performs children's concerts with Mr. Ben (most Thursdays at 11:00am at Cultured Caveman in Kenton) and bluegrass with The Barnburners. She performed at Pickathon 2015 with Mr. Ben and Red Yarn on the Big Top stage. Meghan has taught preschool, elementary, middle, and high school age students, as well as adults. She has completed Suzuki Teacher Training with Carrie Reuning-Hummel (Units 1A and 1B), Edward Kreitman (Units 2 and 3), Edmund Sprunger (Unit 4), and Teri Einfeldt (Practicum) and in 2006 was awarded a scholarship by the Suzuki Association of the Americas. She maintains active membership in the SAA and the Oregon Suzuki Association. In 2015 Meghan was invited to teach as a guest clinician at the annual Suzuki Violin workshop at Music Center of the Northwest in Seattle. Meghan is committed to ongoing professional development. In 2013 she became certified in the O’Connor Violin Method in order to blend best practices from both the Suzuki and O’Connor methods in her teaching. In 2015 she completed "Suzuki Principles in Action," a course that guides teachers in evaluating their effectiveness and identifies specific avenues for growth.